What engineers can do to prevent a repeat of this winter’s floods comes under scrutiny at a series of events this week. Shakespeare understood – for various reasons – that comic relief was an essential element of his work and in mid-February an unexpected source provided a belly-laugh during TV coverage of the flooding. Appalling weather in December 2013 ensured that hundreds of people had a dreadful Christmas break and by the new year flood waters were making life in the Thames Valley equally difficult, prompting 24-hour news teams to devote their energies entirely to the threat. By mid-February the Royal Princes were found trying to do their bit in the Berkshire village of Datchet, with Prince William suggesting to journalists that they stop reporting and do their bit to help in the relief effort. As many of you will have seen, this was recorded by a TV camera crew, plunging this writer’s household into a guilty chuckle before being brought back down to Earth by the immediate and urgent problems raised by the flooding and those that await when it has abated. Relief efforts go up a gear today with members of the armed forces being trained by the Environment Agency over the next week to act as flood defence assessors. Over 3,000 service personnel have so far helped in efforts to alleviate the flooding countrywide and over 200 more will act on behalf the Environment Agency to support the assessment of around 150,000 flood defences. According to the MoD, the assessment is expected to take six weeks with military personnel working independently and alongside Environment Agency flood defence inspectors to fulfil their remit. More flood related events take place in Parliament this week, with Patrick McLoughlin, the secretary of state for transport, giving oral evidence on rail flooding, and MPs debating flooding in the South West amid calls for railway flood-resilience funding. McLoughlin will be asked by a Commons Select Committee about what government can do to restore rail links to south west England, following the collapse of the sea wall at Dawlish. 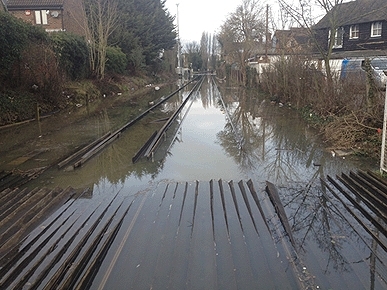 The committee will also ask questions about how flooding is affecting other parts of the rail network and whether better infrastructure planning could have prevented the current situation. Last Wednesday Network Rail said it would be mid-April before repairs at Dawlish are complete, with severe weather having hampered efforts to date. Flooding is high on the agenda this week with the Royal Academy of Engineering convening for a lecture and discussion about how England can protect itself from such events. The lecture at Lessons learned in managing the winter floods – the engineering response will be delivered David Rooke MBE FREng, executive director of Flood and Coastal Risk Management, Environment Agency. The lecture will be followed by Q&A and discussion chaired by Jim Hall, Professor of Climate and Environmental Risks and director of the Environmental Change Institute, Oxford University. From one very real disaster to a simulated series of events that aim to provide more understanding about how pedestrians move through public spaces, specifically rail or underground stations. There won’t be too many readers who’ve yet to suffer the discomfort of a sudden, ominous surge on a busy railway platform, or been stuck in a railway station’s stairway or corridor as passengers file slowly to and from ticket barriers. With this in mind, Greenwich University’s Fire Safety Engineering Group is looking for volunteers to take part in the two day simulation, with one outcome being the improved design of stations and their surrounding environments. Collected data will also contribute to improving computer simulation tools used to simulate evacuation. The research will take place on Saturday 29 and Sunday 30 March and volunteers, who can take part in one or more days, will be required to attend between 8am and 5pm. Those taking part will be be given £45 each per day to contribute to travel and incidental costs. Finally, SMEs are urged to attend Finance for Growth in Coventry this Thursday, to learn about funding available for manufacturers to support research and development. Manufacturing SMEs will be able to book one to one meetings with the Business Growth Fund, Eisvogel Capital, Business Innovation Fund, Green Bridge Supply Chain programme, R&D Tax Credits, TSB SMART Grants, Foreign Exchange and CASiM2 & MTC to gain individual advice. I think we need to ask ourselves how much we are willing to spend on what is a rare event. Yes this flooding is terrible for those involved, and yes key infrastructure such as rail lines should be protected, but what about the hundreds of thousands of homes up and down the country that are on flood planes? Must we protect them all from a 1 in a 100 year or 1 in a 1000 year flood event? Is the money best spent on this or improving cancer care for the over 60’s say? Is the inconvinience of 10 worth the life of 1? These are difficult questions. As engineers we may be quick to reach for technical solutions, but this should be tempered with a broader view of how society directs finite resources. Personally I don’t hold the environment agency responsible, in fact I think that attributing responsibility for what is a natural event is rather rediculous. They followed the spending rules as layed down by HMG, perhaps some of the calculations were in error, but I believe the severity of the weather was quite unusual. Perhaps the only lesson to be learnt is to put in place improved emergency response, and to modify planning laws to impove new house buildings in flood planes to make new builds flood proof. or alternatively do not build on flodd plains as that only moves the problem downstream. Allow flood plains to flood as intended. When the housing estates were being built at Didcot north of the railway line it was 3 feet deep in places whilst building was still taking place. This area is now drained to create problems downstream on the Thames whereas before the area used to hold the water back. Whilst I agree that holding the Environment Agency responsible for the weather conditions that created the floods is ridiculous, holding them responsible for the state of readiness for floods, and response to them, is not. There is considerable evidence that decisions taken by the Environment Agency to partially flood the Somerset levels had been taken as early as 2005, and dredging of the river Parrett had accordingly been curtailed. The building of a new pumping station at Dunball, on the Kings Sedgemoor Drain, had also been scrapped. The 2008 document from the Environment Agency on the ‘Parret Catchment Area’ also admitted that it was ‘not completely clear’ what the effect of the deliberate increase in flooding would be on those whose homes and businesses may be flooded as a result. There also appears to be considerable smoke and mirrors regarding why such decisions were taken. The Agency has stated repeatedly that this was due to ‘funding requirements’. The 2005 policy decision deals with it under the heading ‘Saving Wetland Habitats’ – not doubt the truth lies somewhere between the two. Whilst I cannot speak for the residents of the Thames Valley, as a former resident of Somerset who is familiar with both the levels and the area around Bridgwater I absolutely hold the Environment Agency responsible for poor decision making before the floods, and a lamentable response after them. Recently we have all seen thousands of journalists’ transmission hours and column inches (miles more like) describing the problems of water in the wrong place. I have grown tired of politicians and experts adding their thoughts too. Not one has removed a single litre of water from where it should not be. I have a solution: give half of them shovels and sand and bags and the other half buckets and make them part of the solution, rather than grumbling about the cause. Job done! We’re a small island and need to maximise available land; including flood plains. York houses near the river have the car port at the bottom that can flood with the living areas above. The Environment Agency saying we can’t afford to protect all the coast. We can; just think like engineers. The sea provides a force; lets use it. Forget about wind power. Its too inconsistent. Build barriers off the coast incorporating turbines. We would solve the coastal erosion and have a predictable energy source. Take a lesson from the past. The previous generation built Mulberry harbours to assist in the D Day landings. Take a similar idea and your half way towards building the barrier structures we need. We live in the Thames Valley, bordering on the Thames and have witnessed first hand the effects of this winter’s flooding. We were one of the lucky ones. Our house is elevated on brick stilts and so although access was by canoe only (too deep for Wellingtons) the house was not flooded and we had over 2feet still to go. Water flowed around and under the house, but not within. My point is that you can build on a flood plain, but the property needs to be resilient. This is not just the floor height, but also ensuring the electrics, junction boxes, and consumer board are sufficiently elevated and that sewers and drainage are properly sealed to prevent sewers from being overcome by flood waters. I was amazed how well the sewers coped despite the manhole cover being several feet underwater. Well done TWA! But what of the older existing properties that did flood? Speaking with an architect friend, we believe that many of the flooded properties, particularly the typical riverside detached timber and brick bungalows could be cost effectively raised to say 1:100 level using RSJ beams to jack up the entire building and re-brick underneath. Modern techniques should allow this to be carried out without skew to the structure, which would cause cracking and faulting to the property. Approx cost would be £50k per house. The oversite could then be replaced with a permeable (non-conrete) oversite, reclaiming the flood plain and allowing minimal impedance to flood waters. If we were able to elevate 1,000 properties this would cost £50M and would save many of the worst hit properties with a simple scheme that doesn’t take 12 years+ in the planning stage and provides valuable contruction jobs for suitable SME construction companies. V interested to read of the proposed tests/trials at Underground Stations arranged by Greenwich University. May I advise of a not dissimilar test conducted during the rehearsals for the Olympic Games. It was my privilege to be a Volunteer/Games-Maker, involved in this. Whereas it was recognised that visitors to the Olympic Park arrive in quite a random stream -wave-like flows- they leave almost as a torrent! The concern of the organisers was that if a tube-train broke down at a critical moment, there could be two ‘trains-worth’ of travelers trying to get onto and being on the platforms at the same time. The volunteers, notionally waving good-bye to those leaving were briefed, had there been a stoppage, to spread across the flow, and slow things down. We did try it twice, and it was very effective. A smile, our big hands and a uniform, and a simple explanation to those immediately close-by, passed on through the then stationary and corralled (into about 2,000 person sections) crowd… works wonders. If the intention is that we plan for a once in 100 years event…then I have to believe that some type of flexible structure -deployed in good time and as and when needed and not a permanent ‘change’ (surely the Environment Agency NOW has enough data on speed of build-up in particular rivers) for each household, is a more cost-effective way forward. I can only base my views on perceptions of what I saw on TV images, but it appeared that those householders who had materials ready (plastic sheets, large sheets of plywood, sandbags, duct-tape, props…) were able to protect their properties effectively. Yes, there is going to some slight inconvenience and there will always be a few ‘dribbles’ but that is surely better than permanent wholesale changes. Every now and then (I know not if the BBC simply digs out old footage or sends reporters to film such every time it happens) we are treated to pictures of the residents of the Gulf States in the USA boarding up their houses for the arrival of a hurricane or storm surge. Presumably for 99% of the time, such houses are NOT permanently altered: for it is unnecessary. Surely it is the Householders responsibility to do what they can to protect their properties, NOT wait for someone else to do it for them. I point out that my past “textile” career included developments of various fabrics to be part of flexible dams, tanks, drogues, barriers, and so on: there are many firms -sadly not many are UK based -who offer these types of fabrics and structures. Engineers living in Guildford may be familiar with a large underground car-park -under a shopping centre. At the deeply sloping entrance, and there to protect the parked cars, is one of these fully-collapsible (and except when needed, totally hidden) fabric dams. It can be raised in a few minutes, manually. Another concept that Engineers may be able to work-up into an effective support is the ‘barriers’ that are at the end of every RAF Station runway: in this case deployable in a few seconds, and there to ‘catch’ aircraft if their brakes or drogue shutes fails. These are used only perhaps once per year, but saving a £20,000,000 aircraft (and its crew) by the expenditure of say £20,000 is considered very cost effective. In fact NASA had a similar item, there to ‘catch’ the Space Shuttle if its brakes failed. The specification for this was that it could be moved/deployed to any of the possible landing sites in a maximum of 6 hours. I noted the comment from one correspondent about using the very forces -the sea and the flow of a river- as the vehicle to support our efforts. Isn’t that what Engineers should do as a matter of course: use what we find free! At Axe Yacht Club, we had a problem with the silt coming down the river Axe and depositing itself in ‘our’ man-made yacht moorings where the flow is so slow that the silt can fall to the bottom. We are experimenting with what I have termed ‘ventubes’ [Venturi tubes!] -fabric pipes immersed in the river (when in flood and collapsible onto the river bed when not) and there to hopefully accelerate the flow to keep the particulates in suspension. Is there some mileage in this idea elsewhere? Just as my own home insurance premium is reduced (slightly) because I have fitted fire-extinguishers as necessary , surely a similar carrot could be offered to householders in potentially flood-able areas. Perhaps a strategic plan for flood protection is what is needed for the risk areas based on protecting both habitation and industry including agriculture which still forms a major business sector. For those rivers effected by tidal surges I think it is time to think of barriers that can produce energy as well as protection. Yes, that old chestnut of the Severn Barrage comes to mind that would at least give some long term green return on capital investment. And where, pray, will the water go that found its way to the floodplain? [The] Today [programme] then invited John Stewart of the Home Builders Federation to defend the industry’s position. The discussion then descended into real lunacy in his “don’t blame us guv” stance. Mr Stewart’s defence started with an explanation of what builders do about water running off of the places where they put new homes. No one, he insisted, had built houses in unsuitable places. The builders all had planning permission and they all had to install SUstainable Drainage Systems (SUDS) to ensure that their new developments did not contribute to local flooding. So far so good, but then the fun began. In any case, Mr Stewart continued, it wasn’t the houses that caused all that flooding. “I suspect that the water comes from somewhere else, not from the new housing itself”, he told James Naughtie. Mr Stewart didn’t just say it once, he repeated this strange assertion. After you have picked yourself up off the floor, the immediate response is to ask which bit of the word “floodplain” doesn’t Mr Stewart understand. Flood or plain? Of course the water came “from somewhere else”. (And no, not just the sky.) That’s what a floodplain does. It is somewhere for water to sit until it feels the urge to move on. Stand on many a floodplain in England and look around you. What do you see? Here in Sussex the view often takes in the South Downs, a rather nice range of hills that we walk as often as possible, rain permitting. Guess what, Mr Stewart, water runs off those hills. Where does it go? Into the flat bits at the bottom. These are floodplains, places where water hangs about until a nearby stream or river has emptied out enough to carry away the water. The water that floods those houses might even come from that river. Rivers do not have infinite water carrying capacity, as they know on the Somerset Levels. Shove too much water into a river and it may well overflow on to the floodplain. Yes JohnD. You can make homes “floodproof” in a floodplain, but is that wise? Where do you expect the people who receive your runoff to move to to make room for the water that you and your neighbours have displaced? Probably somewhere cheaper. Why has there been so little reference to the Foresight Project Flood and Coastal Defence? Now nearly 10 years old, this warned of the risks that have since come to pass and suggested plenty of responses. So far, the only one I have heard mentioning it was the convicted criminal Chris Huhne. As Sir David King, the government’s Chief Scientific Adviser at the time of the exercise, said “we must either invest more in sustainable approaches to flood and coastal management or learn to live with increased flooding”. Not much sign of any of this happening. enjoyed reading Michael Kenward’s comments and blogspot. He describes yet more ‘paper’ and reports created by persons unknown (before or since) but holding centre stage for those few brief moments in-between oblivion! I am somewhat reminded of a comment from a neighbour during our time living in the States in the late 60s. This chap worked for a part of Boeing who were making sections of the Apollo rockets. He was firmly of the opinion that had all the paperwork and reports created by that project been piled up, they would have reached the moon before the rocket! The astronauts could have walked there. Nonsense of course, but…I believe a not unknown situation! The prospect of Death in the morning concentrates the mind. (Voltaire?) Presumably inundation of the Houses of Parliament and/or Whitehall the next time would have the same effect.